Portrait Workshop - website:www.portraitworkshop.com blog:www.caricature.com.sg: Art Theft! 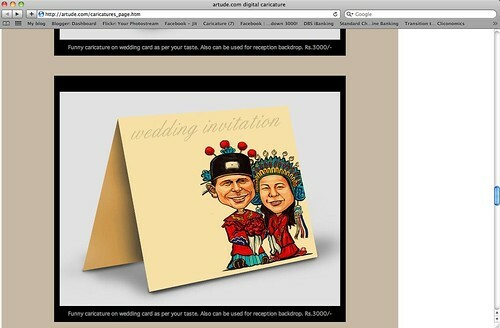 Elo, one of my caricaturist friends on Facebook, told me that he saw my artwork on www.artude.com. Of course without my permission. My signature and blog link were removed, left the caricatures. This is not selling my artwork for me, but using my artwork to get business for himself! Kamal's caricature artworks was stolen too. He sent him an email, demanded him to remove them. He removed them, without any apology. I did the same, but twice (second time via email), as he (Skype ID as on his website: ManojMaani.com ) didn't take any action after my first message to him via his contact box on his website. Probably he has stolen too many artists' works, and didn't know which one I am referring to. After about one week odd, he removed it eventually, without any apology. This wasn't the first art theft case. I don't understand why these people would do such thing, since they can draw. Moreover, in this internet age, it will be exposed eventually. How will they answer to the clients who ordered it, when they can't deliver such style? !